Some years ago a fellow creative director at a reputable agency told me about the time he returned from holiday and saw a proposal that had been drafted in his absence. The 'big idea' hinged on a well-known personality all 'branded-up' doing a dance on the fourth plinth of Trafalgar Square. It would get coverage for sure. Lots of it. The only problem, and one quickly identified by my friend, was that the personality the team had picked was Nelson Mandela. Numerous issues (health, dignity, reality etc) aside, the team had also budgeted a fee of around £10,000 for Nelson to fly over from South Africa and then perform for media and bewildered tourists in the name of an FMCG product. Needless to say it never came to fruition despite the very best intentions. The truth is most stunts - and usually the best ones - are done on limited budget with huge ambition. We can all have a big idea but have to scale them down, take off a zero from the costs and sweat the idea for the best results. Hence why our own little ‘big’ idea for GAME in December was putting Christmas dinner in a tin for gamers. No more, no less, no Bompas & Parr. It worked because it did what it said on the tin. So you have to hand it to Paddy Power for its latest - and possibly finest - stunt with Professor Stephen Hawking. As PR stunts go this is epic in ambition, theatricality, scale and, no doubt, budget. Moreover, it actually pulled it off. In stunt terms it is a blockbuster. The idea itself isn't original. However, it’s not about the idea but the delivery. For a start, academic collaborations and scientific formulae are a tried and tested PR formula in themselves (this writer did one for the perfect cup of tea long ago that was probably not the first and has been repeated more than once, but with even dodgier science). Secondly, in 2006 Ladbrokes hired a maths boffin to calculate the formula for penalties as its big World Cup idea. Paddy Power repeated this as part of its study, but not with A.N Other academic. It went to the very top and got Hawking. That was the difference. It had the 'wow!' factor. The use of Professor Hawking is what made this formula story brilliant. No compromises. Work with the best to stand out. The man is a genuine icon in an age when the word is applied – typically by those who work in media – to anyone who is fairly well known. That he should team up with Paddy Power is news in itself. What is so admirable is that it didn't just get the Nobel Prize-winning physicist to front its work with a photo and a quote – he actually did the maths AND presented his 'What it takes for England to win the World Cup' statistical findings at a press conference at The Savoy. The media event was the cherry on the cake. How often does a journalist or broadcaster get to attend an event with Professor Hawking? And when does a story get the same positive treatment from the likes of the science correspondent of The Guardian and a sports hack from the Daily Star? Put simply, corners were not cut and the coverage reflects that. 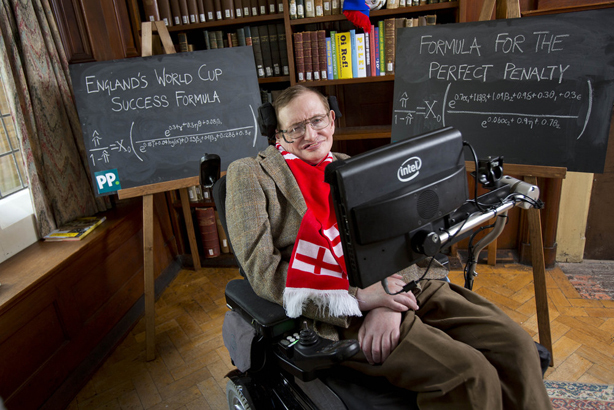 Hawking is probably the only scientist who could be named by the average sporting punter. Meanwhile the collaboration would appeal to the wider public, who admired the applied thinking in this unlikely alliance. The other element is the timing. All of Paddy Power's competitors will have tactics and campaigns in place before 12 June when the World Cup kicks off. Paddy Power dropped its bomb first, much earlier than expected and, I suspect, it has blown everyone else's ships out of the water. Finally, the campaign enabled Hawking to simply do what he does best: talk maths. He didn’t have to change his name, wear a football strip, pose with a WAG or float down the Thames. It may not quite be Nelson Mandela dancing, but the world's most famous scientist, whose previous work includes the Big Bang theory, leading a football campaign for a maverick bookmaker is about as close as it gets.